Progressive collapse (robustness) resistance of tall timber frame buildings with CLT floors. Progressive collapse is characterised by a disproportionate and severe collapse of a structure due to local failure, which is usually caused by accidental or abnormal loadings - such as gas explosion, fire, blast or vehicular collision. As the height of timber buildings increases, so do their potential risks of progressive collapse. While progressive collapse resistance of concrete and steel buildings has been widely researched, very limited published studies have focussed on mass timber buildings. This project aims to understand the progressive collapse mechanisms of mass timber frame systems with CLT floors through a comprehensive experimental program. 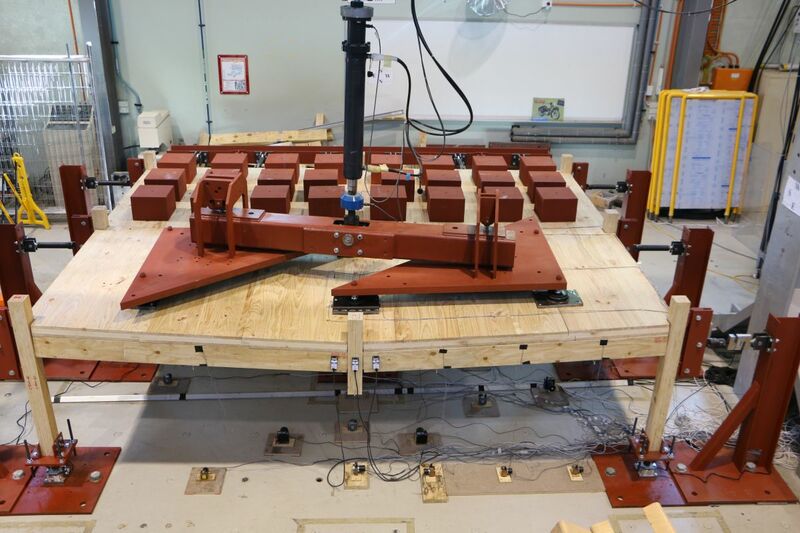 Advanced numerical tools, calibrated against the available experimental tests, will also be used to quantify the factors influencing the progressive collapse mechanisms of tall frame mass timber buildings through parametric studies. Edge column removal will be the focus of this research but other column removal scenarios will be investigated in the future. Investigating the progressive collapse mechanisms of tall frame mass timber buildings through experimental tests performed on scale substructures and edge column removal. Developing advanced numerical tools calibrated against the available experimental tests and use them to quantify the factors influencing the progressive collapse mechanisms of tall frame mass timber buildings through parametric studies. Developing and test new connectors to enhance the progressive collapse resistance of tall frame mass timber buildings. Verifying the accuracy of the current design and detailing guidelines to resist progressive collapse in current design specifications.